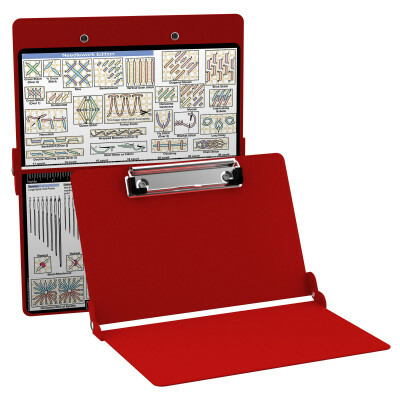 This is a full size folding clipboard with everything you need for needlework and stitching. 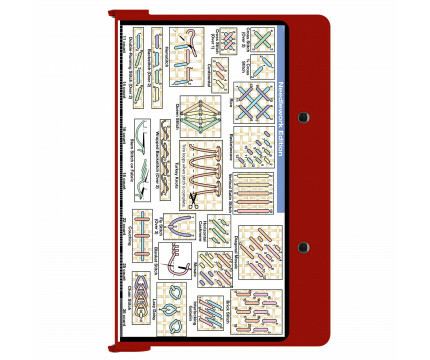 It features a full outside label with 37 stitch diagrams, 4 needle size guides, a thread count ruler, as well as 6 inch and 15 centimeter rulers to guide you as you stitch. Our ISO Clipboards are strong and sturdy enough to carry anywhere and fold to fit easily inside project bags. 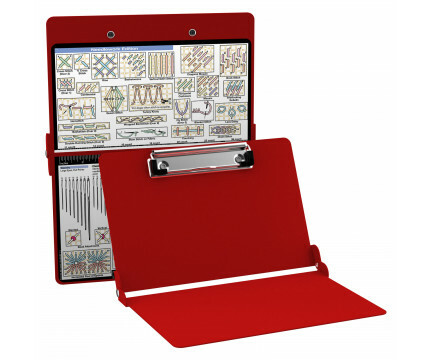 This particular clipboard is made of steel so you can attach your magnetic needleworking tools. 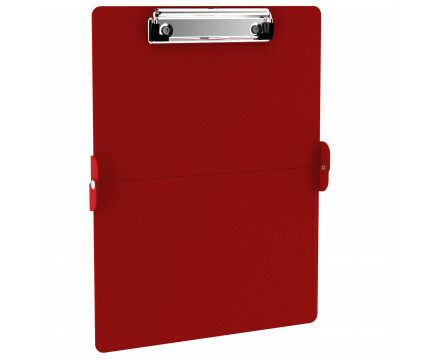 Secure and protect up to 30 pieces of paper inside this clipboard without a crease when folded. 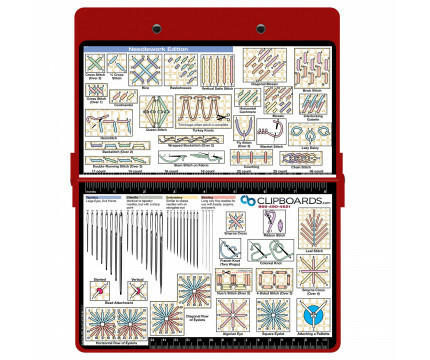 Hover over the clipboard images above to display high resolution details. 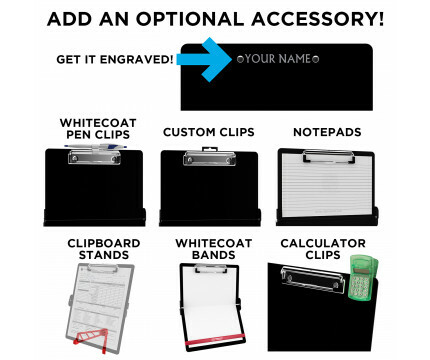 Get a pen clip designed for your Clipboard. 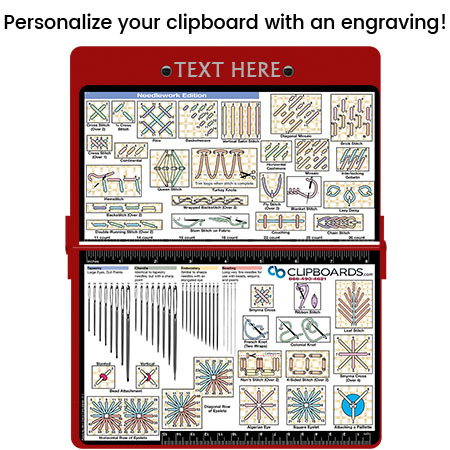 This clip will fit above the paper clip without covering your engraving. Purchase a pen clip and get one of our pens! Click here to see full details. 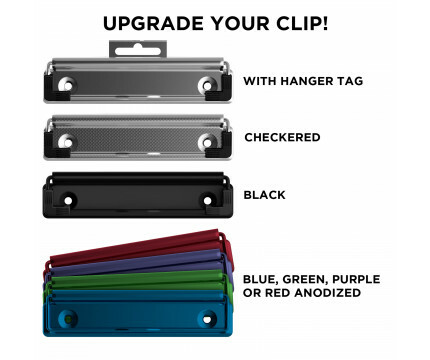 The ISO Clipboard Band is our exclusive elastic rubber band to secure all your documents and prevent flaring on our folding clipboard. Use this band with any of our clipboards to help secure and protect your vital notes, patient documentation, or simply to hold down any paper within your clipboard. Click here to see full details. Our 8x5 notepads fit the clipboard perfectly with removable sheets that don't interfere with the foldability of the clipboard! Click here to see full details.